The best air impact wrenches are able to put out more torque than you might think, so the drive mechanism cannot be poorly manufactured. Because commercial use is often in heavy work areas where the equipment itself takes a few hard knocks, you should check that the casing is as sturdy as the guts. Make sure that your impact tools have a half-inch drive, because anything less is not going to handle a heavy workload without frequent overhauls. These top rated air impact wrenches were chosen to meet those requirements, and have some additional benefits of their own. Obviously, you’ll need a set of impact sockets a good enough air compressor for impact wrench use and something like a Goodyear air hose which can put up with a lot of “dirty floor” abuse. If working around cars, a good retractable air hose reel is highly recommended. Don’t let the size fool you, this is one monster of a wrench. The 1/2 inch air impact gun can deliver up to 1,350 foot/pounds of loosening torque (930 foot/pound max torque) while remaining light enough that you’ll experience minimal fatigue. The four position power regulator allows for quick torque adjustments, and the twin-hammer mechanism adds durability. Speaking of durability, the hammer case is made of titanium and the wear plate of steel to help ensure this wrench can handle plenty of abuse. There’s no denying the power and low weight of this impact wrench, as the majority of owners will tell you. An excellent choice for both auto shops and mobile repair services, owners have reported this tool can outperform more expensive models. The durability is also high enough that the 2235TiMAX will remain with you for many years to come. It’s a favorite of Garage Tool Advisor readers. While the gun itself is of excellent quality, many individuals have reported receiving used tools after purchasing. This has led to several issues with parts breaking and owners have complained about fees when returning a damaged or used tool. While these issues don’t make this wrench any less desirable, caution should be taken to ensure you’re purchasing from a reputable retailer. 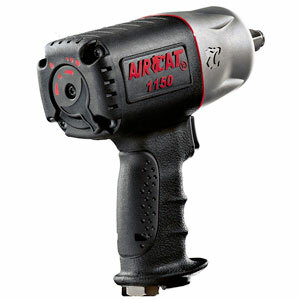 The AirCat 1150 is one of the top ranked tools in its class for both performance and quiet operation, making it an impressive air impact wrench. Professionals will tell you that it performs as well or better than similar guns which sell for much higher prices. If you need the AirCat for working on engines or older vehicles, you will like the 1,295 ft-lbs of loosening torque (and 900 ft-lbs max torque) this gun can generate. With a smooth hammer speed (1,400 blows/min), it’s intended to remove bolts rather than break them. 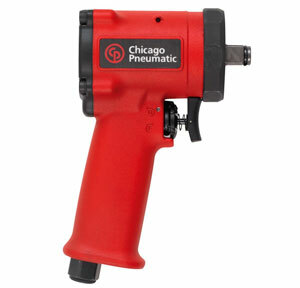 It is much quieter than most other impact wrenches, generating only about 86db at maximum pressure. An AirCat 1150 can even be rebuilt by the user, which will reduce your costs over time compared to tools which have to go back to the factory. You will not find many complaints about the AirCat 1150, but one key item comes up fairly often. The drive mechanism, called an anvil, does not secure the sockets very well. This is easy to work around by simply putting a small piece of paper over the anvil as you slip the socket on, which adds just enough extra dimension to hold your sockets firmly in place. For quiet operation and high performance, the NitroCat 1200-K is similar to its cousin, the AirCat 1150. While it has the same max torque and reverse torque rating, it operates at a lower 950 impacts per minute so it feels a bit more violent (watch your wrists!). The NitroCat is a favorite with NHRA race teams, which is a good indication of how well it can handle hard use and heavy handling. Another noticeable difference between this tool and the AirCat 1150 is that this one is quite a bit larger, even though they both weigh the same. When you’re first getting used to this tool you have to remember that it has a lot of torque, and you could easily wring off bolts. After you become familiar with it, you will learn to avoid this problem. The NitroCat comes with a 2 year warranty and you can rebuild it yourself after the warranty expires. Unlike the AirCat, the anvil is better designed and sockets will not slip as much unless they are worn from use. 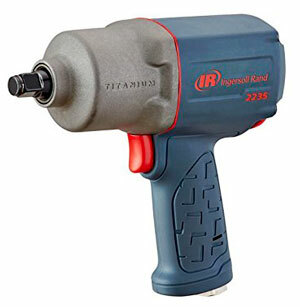 You can’t go wrong with Ingersoll-Rand tools as the brand currently makes the best air ratchet in the biz. While not flashy, the 231C has power and build quality at an affordable price. The worst complaints with it concern the manual, not the tool itself. If you do not understand the instructions for subjects like where to keep it oiled, you can get telephone tech support to explain items which are unclear in the manual. 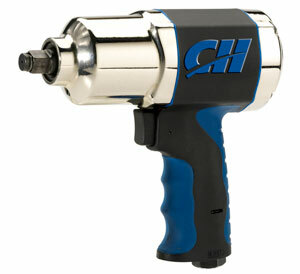 Otherwise, the 231C is a highly rated air impact wrench for any application. Of all the best 1/2″ air impact wrenches, it is also the loudest, so be sure to use hearing protection when using it. The anvil allows you to swap sockets easily, but you may run into a problem with them slipping off if your sockets have some age and wear. As with the AirCat 1150, using a small piece of paper between the anvil and the socket will let you use those older sockets for a lot longer without having to buy new ones. It may seem like a cheesy fix, but all you need is to add a tiny amount of width, and paper is easy to come by. Be careful making short jokes around this 1/2-inch pneumatic impact wrench, as it loves nothing more than proving size doesn’t matter. Weighing in at a modest 2.9 pounds, this driver can provide 450 foot/pounds of torque in very restricted areas, thanks to its tiny 4.4 inch length. Requiring two drops per minute of an air line lubricator (or a bit of motor oil daily), this wrench can perform for long periods of time and needs minimal maintenance. The one-hand trigger features three position settings in forwards and reverse, and can be used in either hand equally well. When it comes to stubby impact wrenches, the consensus is that this one’s the best out there. Owners of this wrench have handled some very difficult bolts with ease. They also note a much lower risk of stripping and an excellent degree of control compared to similar models, making this a safer bet when working with already damaged fasteners. The smaller size of this tool means it wasn’t designed for heavy-duty torque, restricting its usefulness for some applications, although its ability to function in close quarters is a worthwhile trade-off. Use this wrench in conjunction with a larger, more powerful model for maximum usability. This popular inexpensive impact wrench has a composite lightweight design to give improved durability and lower vibration so you can work longer before suffering fatigue. Capable of 550 feet/inches of max reverse torque and operating at 8,000 RPM, the wrench holds its own in a wide range of tasks. A three speed power regulator provides maximum power in reverse mode, so you don’t have to change out in the middle of a job. For the low price, this impact wrench packs a lot of power and can outlive similar models when properly maintained. Users have had great success on a wide variety of home and automotive projects, even against rusty lugs. For the average homeowner, this tool can compare to far more expensive models with only a minor loss of quality. 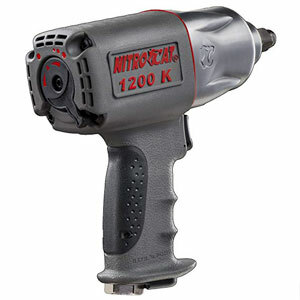 The biggest drawback to this impact wrench is that it was designed with limited home use in mind. It can be used commercially, but if you work on cars professionally, there are better models out there. Make sure you also have at least a 6-8 gallon compressor for this tool that’s capable of around 5 CFM, as some smaller compressors simply won’t be able to keep up. The Aircat 1150 does not deliver as advertised. It is supposed to deliver 1295 ft lbs in reverse, but I had mine tested by the factory and it only delivered 375 ft lbs. They said that nothing was wrong with it, but would not comment on the difference between advertised 1295 ft lbs and 375 ft lbs actual in their testing department. That’s really odd. While I believe you’re right that they probably over state the torque in their specs (as other manufacturers do), I find it hard to believe it’s that big of a difference. 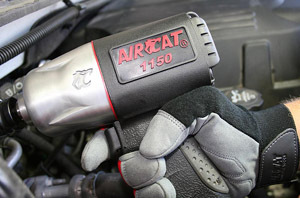 Using both the AirCat and NitroCat, the power feels similar (both rated at 1,295 of loosening torque). I’ve never had it fail to take a nut off, even on an old rusted clunker. Curious why you had it tested? By a local shop or manufacturer? As I stated in my original comment, I had the wrench tested at the factory. I had it tested because it would remove only 2 of the 8 lug nuts on each of my 2 rear wheels on my pickup. I removed the other 6 with my torque wrench set at 150 ft lbs in reverse. One rep at the manufacturer said that the 1150 AirCat needed at least 8 cfm and 12 to 15 would be much better along with 1/2″ hose no longer than 10 to 20 feet and 3/8″ fittings from an air compressor that had at least 150 psi. Seems like a very stringent set of requirements just to get an air impact wrench to remove the lug nuts on a pickup. I’m a professional diesel mechanic, and ive been using the 1/2 in. nitro cat 1200k for about a year now. it can easily remove bud wheel nuts torqued at 550. and while putting them back on, i cant run the gun too hard because it over torques them and the torque wrench clicks immediately. Should I go with an pneumatic or cordless model? I’ve fairly recently switched to a cordless impact wrench and probably won’t go back. Yes, it’s more expensive but the amount of torque you can get from today’s cordless models is really amazing. It’s all a personal preference though. Trying to determine what/who BP on 1/2 air wrench think model 834 or 832. Not so sure the 86db on the Aircat should be considered “only” but I guess for an impact wrench that’s not bad. The Aircat is the better all-around tool. Nitrocat has too much torque for the average Joe in my opinion. I respectfully disagree. Most tools these days are no longer made in the US. 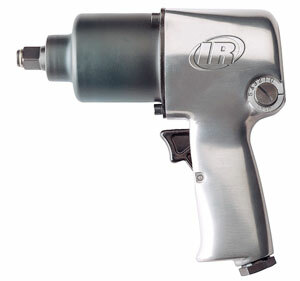 Ingersoll Rand impact wrenches are commonly used in shops and are sourced now from China (assembled in the USA). Even many Snap-on and Matco power tools aren’t made in America. While I’d be the first to look to by made in the USA first, it’s much harder these days. The good news is that the quality of tools made in Asia has gone up considerably over the years. Yes, I’d probably choose a Snap-on or Matco or IR for heavy daily use, but I don’t feel the difference in quality is that great these days. I really appreciate the comment. For the record, I would also choose IR over the others. Price is still a factor when deciding on products to recommend. Originally, the IR wrench above was priced considerably more than the Aircat (which I still think is a good wrench). The price of the IR has gone down since so the price difference isn’t as big of a deal. Due to that, I now swapped the positions of the two. Professional mechanics should not let the fancy name fool them (AirCat, NitroCat), these tools are still manufactured and engineered by Florida Pneumatic. I’ve been testing tools for 20+ years and have found one thing to always be true…Cheap tools are cheap. Price is always something that should be considered. You get what you pay for.